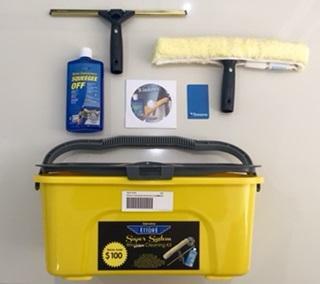 Window Cleaning Starter Kit Professional with Bucket - Super Value for someone who has no window cleaning gear! Do you want to know how to Clean Windows? This is an ideal Starter Kit as it pretty much has everything you need (except for a Window Bucket). The DVD runs you through everything just like a professional window cleaner. Whether your a householder or professional - this is a quality Kit that will Last a Lifetime! If you were to buy everything separate you would be paying over $199! Great Housewarming Gift Idea - Everyone has windows!